How can women best position themselves to navigate today's digital workplace, grow their sphere of influence and maximize career growth. 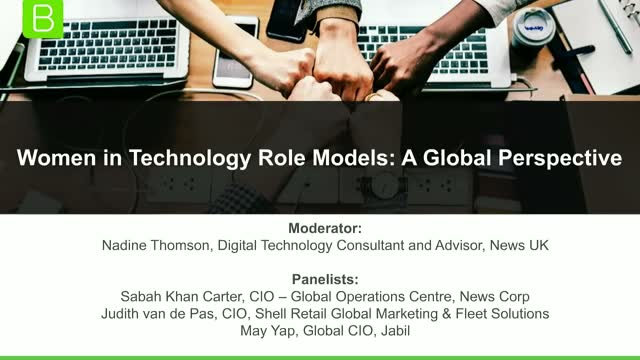 This interactive Webcam Panel session in the "Women in Tech" series showcases the journeys of inspirational women who have advanced their careers in tech in innovative and standout ways. Are you tired of being tired and spreading yourself too thin all the time while running your business and juggling your home life? You love what you do but you feel like your life has become all about work and taking care of everyone else while you’re missing out on taking care of yourself and enjoying life. If you’re ready to make a change and get your life back, while running a successful business but are not sure where to start, then this webinar is for you. Join Mira Rutter, a Work-Life Balance Coach and Strategist who will share with you her top insights and practical tips on what you can do to achieve more balance in your life by focusing on what’s important to you and freeing up time and energy for what truly matters. You will benefit from watching this webinar if you’re feeling overwhelmed with everything you have on your plate and want to lead a more balanced, healthy and fulfilling life while running a successful business. ‘Imposter Syndrome’ is described as an internalised fear of feeling like a fake or a fraud particularly in your professional life, it goes hand-in-hand with self-doubt. Are these feelings hindering your version of success? Join Rosemarie Wilson who will be providing practical action steps to recognise the lie that is ‘Imposter Syndrome’ and what you can immediately do to move beyond your self-doubt. Rosemarie Wilson is the founder of Pragmatica Coaching. She works on the ethos that there are always practical ways to move past your challenges to achieve more of what you want in your life. Rosemarie is an International Coach and Speaker who supports and guides who she works with, to achieve the most incredible results. Getting your foot in the door of your dream career or industry is a tough task. Making your way up is an even more daunting one. This webinar from Women in CyberSecurity (WiCyS) and the Security Industry Association (SIA) will present the findings of The Cybersecurity Imperative research project produced by WSJ Pro Cybersecurity and ESI ThoughtLab and sponsored by SIA. We will share insights into how 1,000-plus organizations around the globe measure their cybersecurity preparedness and how they are preparing for future cyber threats. In this 45-minute program, we’ll also share a new tool that allows you to compare your own organization’s preparedness to the aggregated data of study participants. A new study has updated the ratio of women to men in the cybersecurity workforce – from 11% to 20%. Yet more than 300,000 cybersecurity jobs are unfilled today, a number that is exponentially growing into the millions. Let's do something to move the needle to 50% women in cybersecurity! Women in CyberSecurity (WiCyS), a non-profit organization with deep roots in academia, government and industry, is driving to increase recruitment, retention and advancement of women in cybersecurity. During this engaging webinar for diversity recruiters and women in various stages of cybersecurity careers, we will interview two WiCyS Board Members who offer stats and important guidelines for recruitment and retention of women in cybersecurity. Neurodiversity is oft associated with autism spectrum but can include an array of conditions affecting mind and brain. 70-90% of these individuals are unemployed/underemployed, yet they can bring a lot of value to an org with skill sets in high demand. A neurodiversity program is dedicated to embracing diversity of thought process & background as a way to lead to a more successful and innovative company. Companies SAP, Google, Salesforce, HP, Ford, JP Morgan & Microsoft have already reformed their HR processes in order to recruit neurodiverse talent. Would your org benefit from becoming more welcoming of neurodiversity? What do initiatives look like? This episode is for anyone who works with or could hire nuerodivergent individuals & who wants to find ways to hire, onboard & support those with cognitive differences. This episode comes after many questions about this topic during our most popular episode on diversity and pay gaps, & fits in with recurring themes like designing the career you love, mentoring, & flexible work. Tia Shafee [they/them] is a UK civil servant working in disability inclusion, founder and chair of Public Sector Neurodiversity Network, which connects neurodivergent individuals across the UK public sector & gives them a platform to share their experiences. Samantha Pierce, owner of NeuroDiversity Consulting & founder of the charitable organization Sanchia A Callender, is a training & dev specialist dedicated to creating a thriving empowered community that includes everyone. She enjoys life with her husband & 5 children, two of whom are autistic. Amy Root, associate director of global solutions with UnitedHealth Group, is an experienced healthcare professional with special expertise in design & innovation, medical tech & business ops. As an autistic adult who is raising a child on the spectrum, Amy is passionate about orgs understanding importance of workplace neurodiversity initiatives & thoughtfully creating neurodiverse teams. Have you ever watched a speaker captivate an audience merely by what they say or the way they walk into a room? There is just something about their energy that fills the room and draws you in.They are confident, charismatic, engaging, warm, funny and powerful. This essence is called Executive Presence (EP) and you can have it too! If you want to be considered leadership material or are just ready to up-your EP game, this session is for you. During this session, we’ll explore strategies to help you command an audience of one or thousands. We’ll walk through ways to help you be more "powerful" in the way you present yourself, and show you how small changes could have a big impact on your EP. This session designed for men and women who want to be more commanding, influential and confident in any situation. Women make up only 37% of the tech workforce at entry level, and this percentage drops with each incremental advance in their careers. This series will outline the current state of the tech industry, the challenges women are facing in hi-tech careers, as well as shed light on the opportunities that are opening up for women in tech.